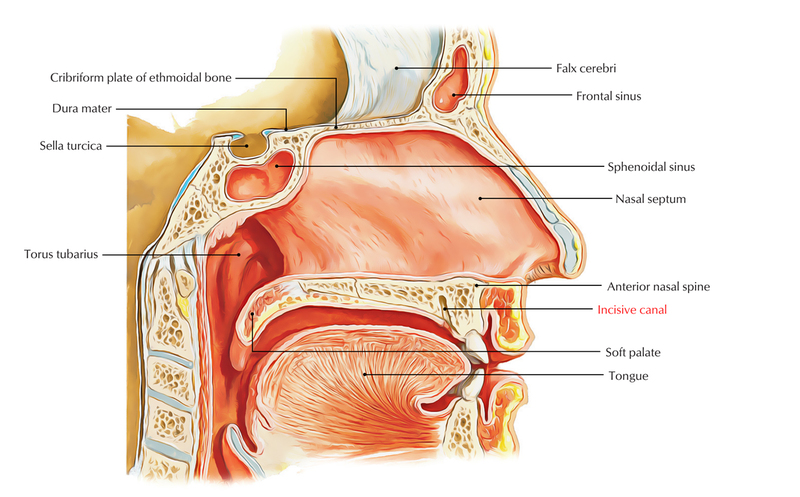 The nasopalatine nerve from the nasal cavity into the oral cavity. The terminal end of the greater palatine artery from the oral cavity into the nasal cavity. The maxillary incisive canal travels via the maxilla within the midline. While opening at the incisive foramen posterior towards the central maxillary incisor teeth, it attaches the inferior nasal cavity together with the superior oral cavity. It contains the descending palatine artery along with the nasopalatine nerve. The mandibular incisive nerve either ends as nerve endings inside the anterior teeth or neighboring bone, or via the tiny lingual foramen may link nerve endings which go inside.